Members of the New Creation Church in Hendersonville, Tennessee glean at the Green Door Gourmet Farm. It seems so simple. About forty people scatter across a field that’s covered by rows of leafy plants. They talk with each other, and laugh sometimes, as they pick kale. This bucolic scene is a common one for volunteers with the Society of St. Andrew. It happens thousands of times a year, in fields and orchards from the Gulf states of Florida and Mississippi, to the upper plains of Michigan and the hills of New York State. That’s part of the draw for tens of thousands of SoSA volunteers each year. They spend a morning outside, working with old friends and meeting new ones. They get some fresh air, and they exert themselves to collect the very freshest fruits and vegetables to help feed the poor, the elderly, and the hungry children of their communities. This group’s pleasant morning in the field it is only one chapter in a story that is begun and completed almost every day of the year. On this day in July, the story will end with homeless men and women from the streets of Nashville receiving the comfort of caring people, and food prepared just for them. This story actually began weeks earlier, when the Green Door Gourmet farm, an urban farm in Nashville, Tennessee, planted a field of organic kale that would mature into a crop available for their own restaurant and for other restaurants in the city. Now with more kale than they need, they contact SoSA to donate the surplus. The families of New Creation Church in Hendersonville, Tennessee answer the call. 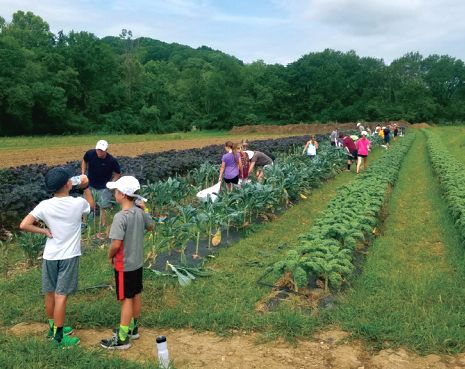 As part of their commitment of caring, they volunteer to gather at the Nashville farm to collect the generous donation and make it available to a suitable feeding organization. A few adults and many youth gather to learn which rows to glean and what the process will be. Then they set to work, gathering dozens of large bags of kale. The receiving agency this day will be the Nashville Rescue Mission, which sends its own truck to pick up the food from the field. This mission has fed, clothed, and sheltered homeless men in Nashville since 1954. It opened its unit for homeless women and children in 1968. The mission houses people at night, provides education during the day, and serves more than 1,600 meals every day at its three kitchens. In the final chapter of this story – at the end of the day – hundreds of homeless people are fed. Each day’s story is a little different … varying by farm, volunteer groups, receiving agencies, and clients. Yet, each day’s stories are dedicated to the final chapter … feeding hungry people in cities and towns wherever there are farms, volunteers, feeding agencies, and hungry people. It’s a story always worth telling!